Would You Pay P2,500 For A Coffee Drink Surrounded By Rats? It is in everybody’s knowledge that rats or rodents live in the dirtiest areas. A sighting of any of these furry creatures can stir a rowdy panic at any home. 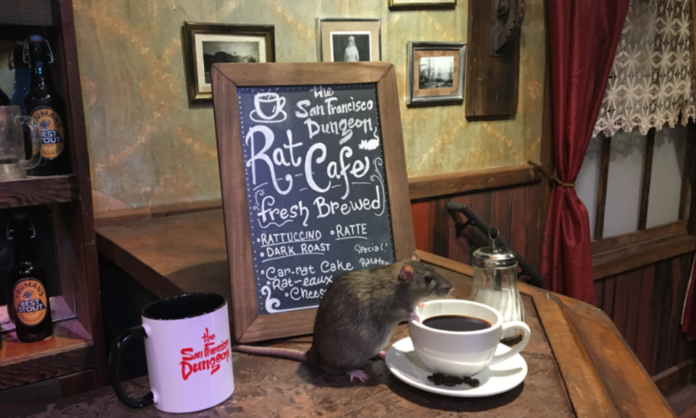 It seems like a cafe in San Francisco is bringing everyone’s nightmare to life by serving coffee surrounded by rats. San Francisco Dungeon, a California-based performance hall gives visitors a tour on its history. A representative from The Dungeon narrates that they could’t think of anything that they could do with the bubonic plague section and so they came up with the idea of having rat café with real rats and rodents. Guests are provided some time to indulge their coffee while being surrounded by rats. Yes, sipping their coffee while having rats running everywhere! The pop-up café is only available from July 1 and July 8 and tickets cost fifty dollars each or an estimate of P2,500 with the inclusion of unlimited coffee, pastries and tea. Despite the fact that they are opening a cafe surrounded by rats, San Francisco Dungeon representative clears that The Dungeon is acquiring rodents from Rattie Ratz, a California-based rat rescue and adoption agency that started in 1998 and has since housed 250 domestic pet rats. Apparently, rats are good pets and is as equally clean as a dog and cat. Think you could handle having your own Ratatouille during your coffee break?